For over a millennium, Asia and the Middle East have been closely connected through maritime activities and trade, a flourishing relationship that has given rise to new and thriving societies across the Indian Ocean region and Arabia. In recent times, with the global political and economic power shifts of the past decade, significant events in the Middle East and Asia have brought about fundamental global change; the Arab uprisings, the emergence of India and China as powerful global economies, the growing strength of various new Islamic movements, and serious financial uncertainties on a global scale have laid the foundations of a new world order between East and West. The current volume examines this renewed global dynamic, and how it is changing the relationships between the interdependent global communities across Asia and the Middle East. 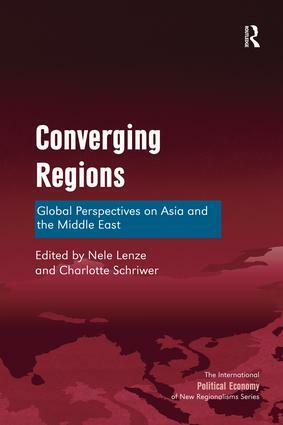 Focussing on the broader aspects of finance and trade between the Middle East and Asia, as well as growing security issues over natural resources and questions of sovereignty, this volume concludes with speculations on the growing importance of Asia and the Middle East in the global setting. Nele Lenze is Research Fellow and editor of the Middle East Institute at the National University of Singapore. She holds a PhD in Middle Eastern Studies and Media Studies from the University of Oslo. Charlotte Schriwer is Senior Research Fellow and Deputy Director of the Middle East Institute at the National University of Singapore. She holds a PhD in History and an MA in Middle East Studies from the University of St Andrews, Scotland, and an MA in Islamic Art and Archaeology from the School of Oriental and African Studies in London. The International Political Economy of New Regionalisms Series presents innovative analyses of a range of novel regional relations and institutions. Going beyond established, formal, interstate economic organizations, this essential series provides informed interdisciplinary and international research and debate about myriad heterogeneous intermediate-level interactions. Reflective of its cosmopolitan and creative orientation, this series is developed by an international editorial team of established and emerging scholars in both the South and North. It reinforces ongoing networks of analysts in both academia and think-tanks as well as international agencies concerned with micro-, meso- and macro-level regionalisms.